Making byronbuckley.com a little more accessible with WAI-ARIA and progressive enhancement. From textbooks to #a11y, accessibility is a topic I was aware of but never tried to learn. Recently, I decided to change that by reading Apps for All, an informative introduction to coding accessible web applications. I was already rebuilding my website around the @DevTipsShow Artists Theme, so I decided to put this new accessibility knowledge to use. Fix the issues identified by WAVE. Fix the voice over issues identified when using a screen reader like ChromeVox. 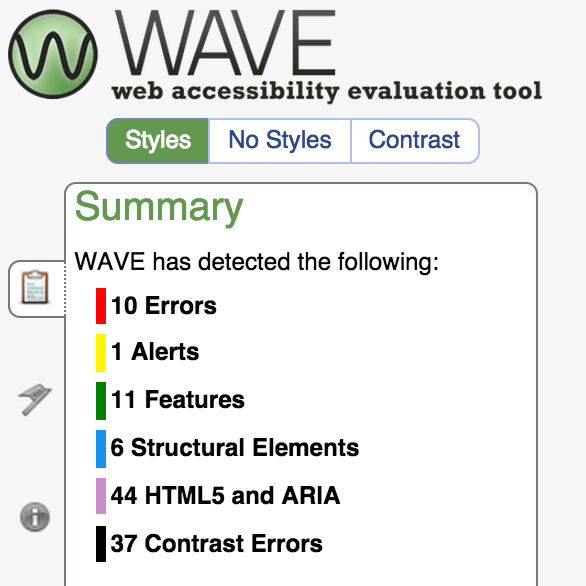 Resolving WAVE’s structural findings was fairly easy; all it took was using the requisite HTML tags, ARIA roles and attributes as advised by the book and relevant documentation. Getting ChromeVox to narrate nicely typically involves strategic placement of aria-hidden and aria-label attributes to resolve faulty dictation. For example: narrated footnote labels seem out of place when listening to a sentence. We can help the sentence flow more naturally by adding aria-hidden=true to the tags. Screen readers utilize headings within <section> tags as identifiers for that area, however I had a few sections that didn’t contain a <h1...h6> tag; in those situations aria-labelledby ensured the section was properly identified. Provide an informative announcement for the work item that has focus. Maintain keyboard navigation while navigating expanded and contracted work item states. Set an aria-label on the <a> tag and disable voiceover for its children. This prevents the screen reader from blurting out a jumbled mess of words according to their DOM position. The aria-label is populated with a sentence built with the available data variables. Here’s an example: “Company: RealDecoy; Tenure: 2011 to 2014”. Create two versions of each detail page; the AJAX version as a “headless” HTML fragment, and a full page version that wraps the former fragment with the requisite template layout. Jekyll helps to keep things DRY by generating both pages from one fragment; which of course provides two URLs. Set the clicked link button as expanded. Set focus to the top of the newly loaded content to ensure the reader starts at the right place. When the user clicks the back link button hide the area and reset focus to the original work item trigger. I think the key behavior or mindset here is empathy. Frequently I found my self trying to experience the site as a keyboard user, or as a screen reader user, which helped me to think of ways to improve the experience beyond arbitrary tag additions. While this page is fairly small, it is also clear that making accessible web pages/apps involves a little bit more cognitive activity for folks accustomed to being focussed on “pixel perfection”. That being said there is still much to learn and apply. Many thanks to @alex_dennis and #a11y advocate @svinkle for proofreading and technical feedback. Should I be denied functionality if I don’t use your app the way you expected?